Expected puppies in the begining of February! Congratulations of Kwin`s Heart with title Russian JCH! Congratulations of Metallica with title Russian JCH! Congratulations of Gembler with title Russian CH! Congratulations of Dzhester Gold with title International CH! Congratulations to the 11-year anniversary!!! Congratulations of Hrabroe Serdze with title Rus CH! Congratulations of Prada and Dewars with title - Champion of Ukraina! 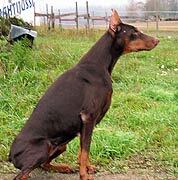 Finished title - Russian Dobermann Club CH! Congratulations of Jakline with title Rus JCH! Congratulations of Inkognita with title Rus JCH! Congratulations of Hi Lux with titles Rus JCH and Rus CH! with ZTP V1B at Norway 10.07.2010,judge Rudi Kilmaier! with glorious results at World Dog Show 2010! Congratulations of Ezhena and Enigma with title Ukr CH! Congratulations of Hrabroe Serdze with title Rus JCH! Congratulations of Adriatika with title Blr CH! Today we congratulate one of our most honoured stud-males with 10th anniversary - Smart Wood Hills Elisir. He is Multi Champion and forefather of many champions. Congratulations to Elisir and his owners Kristiina Aaltonen , Tor Odd and Seba! God grant Elis good health! Smart Wood Hills - Best kennel. Congratulations of Respect Reebok with title Swedish CH! Congratulations of Dewars with title Russian CH! Congratulations of Dakota with title Champion of Russian Dobermann Club! Expected puppies in the begining of March! Congratulations of Uma with title Interchampion! Congratulations of Ezhena and Enigma with titleBelarus Ch! Congratulations of Ultima with titleInterchampion! Congratulations of Respect Reebok with title Russian CH! 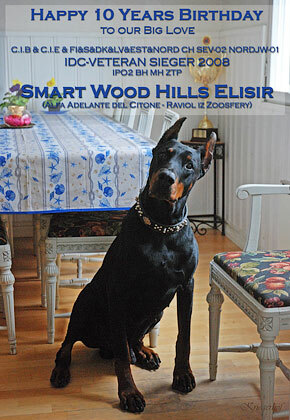 Despite all external difficulties, Smart Wood Hills dobermanns have shown perfect results at all dog-shows from IDC to local shows, have received a true bouquet of titles and successfully passed training tests and trials. All these results confirm high reputation of our kennel! We wish Happy New Year and Merry Christmas to all owners of Smart Wood Hills dobermanns and also we wish them further victories and good luck!